Smart home and AI devices aren’t just convenient — they can also make your home a safer place. | SmashToast, Inc.
Smart home and AI devices aren’t just convenient — they can also make your home a safer place. And thanks to the proliferating internet of things (IoT), good security practices are becoming less of a chore. It’s a little like the iPhone’s touch ID fingerprint reader, or now face ID — it’s more secure than a four-digit pin, and it’s so much easier to use. That convenience is what gets people using the technology, but the added security is the real benefit. So let’s take a look at some of the ways AI is making our homes smarter and more secure. Smart cameras are one of the most useful AI-powered devices you can put in your home — at least from a security standpoint. These cameras can not only act as deterrents and keep you informed, they can record in 1080p, which is important if the police need to identify someone from a recording. These devices can also automatically upload video footage to the cloud for easy storage and playback. You can even tap into the live feed from any location, thanks to connected smartphone apps. And you get all these features from a device that’s essentially plug-and-play. Possibly the most interesting thing about these cameras, though, is how they leverage AI to determine when something out of the ordinary is going on and send you an alert. The Nest Cam, for example, can detect a human figure that appears in the frame in specific zones of your house. That’s smart. Alexa, the digital AI assistant that powers Amazon’s Echo devices, can also make your home safer. While you can control the Echo with your voice, doing all sorts of nifty things like playing music and ordering items from Amazon, the real magic of Alexa is its ability to plug into a smart home network so you control your other connected devices from one central hub. You can connect Alexa to individual smart home devices, or you can go for an all-in-one solution. This technology offers a comprehensive solution for home automation and security devices. 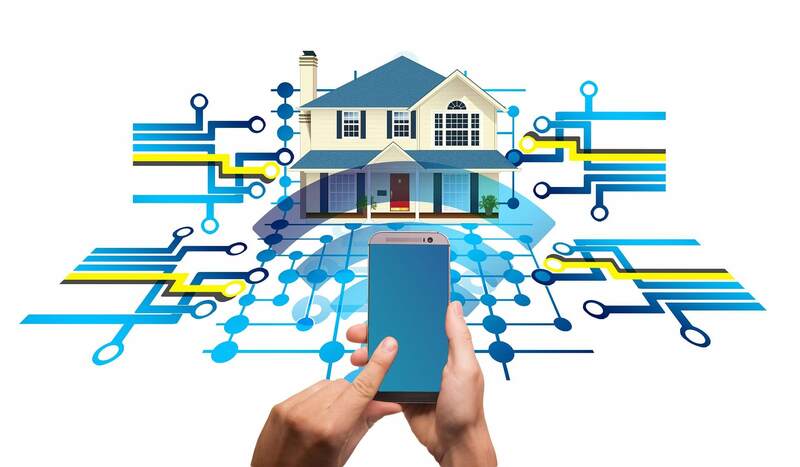 Your home likely has a couple of smoke detectors already, but they probably aren’t as sophisticated as the AI-enabled devices currently on the market. Connected smoke detectors do away with a lot of the annoyances of traditional smoke alarms. For starters, when you have a low battery, you won’t have to try to figure out which unit that irritating chirp is coming from — you’ll get a notification right on your phone. And if the alarm ever does go off, you’ll get an alert that you can view and silence directly from your phone. Some models, like the Nest Protect, will also use a voice alert to notify you of the first signs of smoke so you can make sure everyone’s safe and extinguish potential fires before they spread to the rest of your house. Smart locks offer numerous security benefits. First, you don’t have to rely on a physical key that can get lost, stolen, or copied. You can control who has access to your home by using a simple smartphone app, and you can lock or unlock doors remotely from your phone. Plus, these locks are just plain convenient — it’s hard to beat having your door automatically unlock for you as you approach, which is exactly what you’ll get with some of these devices. August is a big name in the smart lock world, and the August Smart Lock has become the gold standard with its combination of slick looks and powerful functionality. It works with your existing deadbolt hardware, so it’s easy to install. It also uses machine learning to keep a record of who activated the lock and when, which could be helpful if you give babysitters or friends a virtual key to your home. This is an exciting time for the smart home and AI space. We’re sure to see some big advances as the technology matures and more integrations between the various products become available.